“75% of tech changes are about people“. Listen: Really listen to people. Show empathy: Understand how your stakeholder thinks and feels. Work together: Ask your stakeholders for input before a meeting. Take personal risks: Share personal information, to help strengthen the relationship. Give good ideas away: Be generous with ideas, this will earn you credit. Respond quickly to emails and telephone calls: This shows you value and respect them. Relax before a meeting: Take a few minutes to relax so you can be present in the meeting and get the most from it. When discussing creativity Ben mentioned the most important element to support creative ideas and innovative thinking within teams. The need to ensure psychological safety. Key takeout: The need to continue developing soft skills, people skills. For James, the focus is on the Digital Employee Experience (DEX), this is one of the three elements of employee engagement. The others being Physical and Cultural. Talking in this way can help engage stakeholders about business challenges they understand. Digital transformation and Employee engagement. James spoke about the best examples and shared stories on improvements and developments other teams were making with their developments. Including Liberty Mutual , who had integrated and provided a quick way for people to access key information from numerous systems. A simple experience for employees, through a callout on the homepage. This provided a frictionless route for people to perform work activities. Key takeout: The wider concept of digital employee experience. Also the recommendation from James, have a version number for your intranet/workplace so you can see it a product and work on it more like a product management approach. The breakout sessions provide an opportunity to hear from actual practitioners, as well as an opportunity to practice my Dutch listening skills further. How do you change your organisation with a social intranet? First up was Bart Meuffels Community coach at the Child Protection Agency (De Raad voor de Kinderbescherming). He talked about how the social intranet supported organisational change. Involving people across the organisation was an important part of the approach to adoption. This included a competition to name the intranet. Bart also talked about the ambassadors programme, where early adopters helped build the internal community. This allowed organic change, focused on people and co-creation. Roadshows helped to further showcase the platform. Drop in lunch sessions helped engage people about the new platform. Also good to hear was the 9 week plan of approach for leaders. This introduced small steps to get key influencers onto the platform and activate them by, for example, completing their profile. Key takeout: This presentation highlighted the power of a community management approach to supporting business changes. It also reminded me it’s easy to feel intranet management is not saving the world. However, intranet and digital workplace teams are often improving the way people work. This indirectly has an impact of the lives of so many people. Yammer: The digital bridge connecting people. The next session was KLM, where the team were looking to support the 16 KLM behaviours for all staff to support their strategy. Patricia Mars and Linda Krassenburg shared the approach they took to deliver their social strategy. Cabin crew were selected to begin the pilot of Yammer as they have good social media skills and were provided with tablets for their work. With the roll out they focused on 3 core communities which best aligned with their strategy. One supporting idea generation, one for news and one sharing great stories. They shared some good examples of how people were using these groups, to innovate services for pet owners looking for updates on their travelling animals. To sharing CEO messages across the world and highlight the great. Key takeout: The focus on a clear strategy, using ambassadors and community managers provided the basis for a strong community which continues to grow. Patricia Bruisten from KPN shared the 10 years or so of their journey to develop a social platform to support their internal community. Clear management structure involving other departments. Key takeout: Listening to the challenges and approach Patricia and the team took, it was interesting to see the maturity and need to constantly review and change to keep aligned with changing business needs. This goes back to what James Robertson said about using product versioning and looking at it as a product rather than a project or channel. I took the opportunity to jump into an English language session for the last breakout session of the day. James Robertson was back to talk research techniques. James advocates acting like a work anthropologist, spending time with people. Being curious asking questions and observing what people do. This provides a huge wealth of data to highlight the big issues people face in work and can provide useful insights for teams to focus their efforts to deliver tangible results. This type of research also provides valuable stories which can help provide an emotional balance to the hard data behind budgets, project plans etc. This was something which has also a topic from DWG24. Here user testing practices, personas and journey mapping help to give insight to needs, opportunities and challenges for workplace development teams. A short awards presentation saw Krinkels pick up the Intranet Value Award. Then Sam Marshall presented on employee experience. Following on from James Robertsons keynote, the focus was on the experience of employees, using techniques such as personas and journey mapping to highlight opportunities to deliver value for people and make work more frictionless. Sam advised we look at search and signals. The majority of issues with search are not technology issues. Look to provide answers, not links for people. This means focusing on signals, providing clarity with microservices to combine information from multiple systems to actionable cards where people can quickly interact without having to access the more complex and not so user friendly system the data/information is host in. He also talked about boundary objects. These are items which help connect to different areas / fields for people. For example, a building blueprint allows the architect and builder to discuss their 2 domains in a common way. Finding common ways for teams to work across domains can help improve the working environment. And there we are, back to people, the focus of the day, the focus of the near future of work. Intranet Managers, Digital Workplace, Community Managers, all focused on enabling people to work smarter, not harder. The congres featured a suppliers market in the main coffee, lobby area. 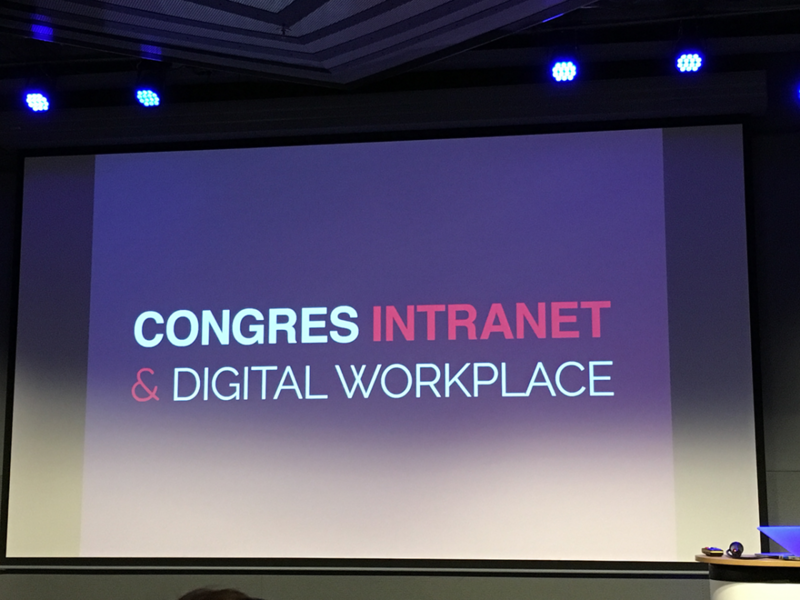 Here various intranet and digital workplace suppliers were showcasing their wares. Personally I was’t a huge fan of this layout, as there wasn’t a natural flow to the room. In previous years, in a different location, the flow wasn’t great. This minor issue aside, it was good to catch up with the folks from Mett, Iris Intranet and Plek and see even more suppliers in a growing market place. I’m not always a fan on big conferences, with large crowds, but this congress, which I’ve attended several times over the years is familiar. You won’t come away with any great revelations, but you will see subtle things, nuances and progression from the stories. As a community, we’re making progress, but we’re still learning together. Experts, practitioners and suppliers together sharing stories and the best ideas. A great opportunity to step away, reflect and learn from others. Find more information about the Congres (dutch) at the Entopic site. Previous ArticleHow can internal communities help change the way organisations work?